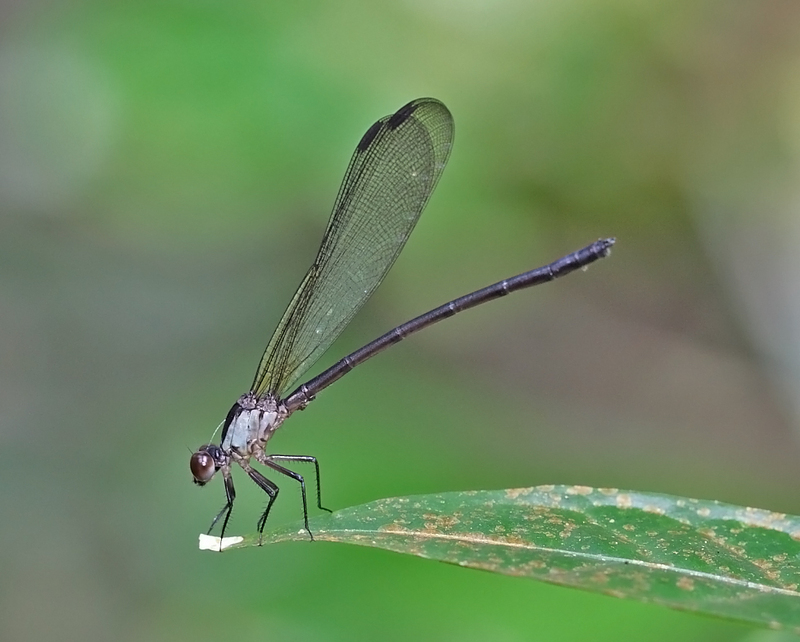 According to the book – “Dragonflies of Singapore”, male Euphaea impar with hyaline wings is a rare form and has been observed only twice in Singapore. 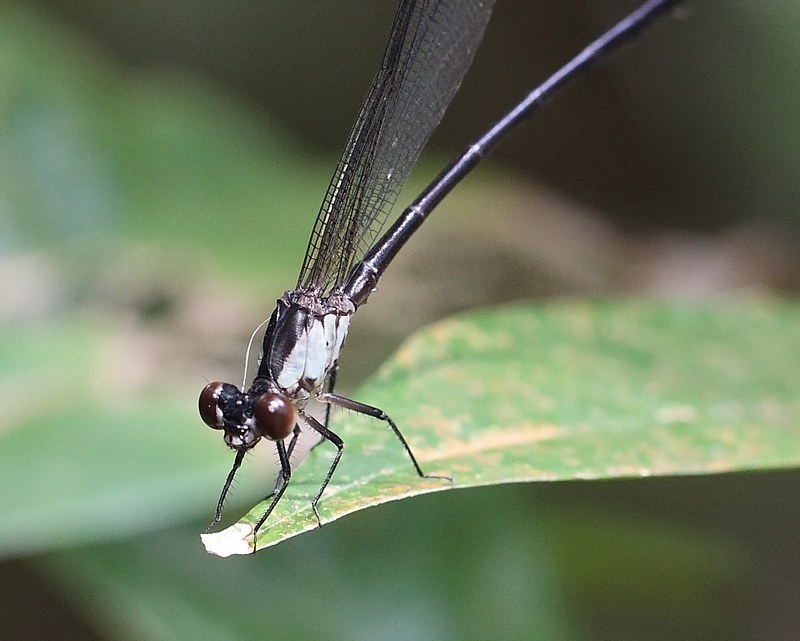 In June 2013, I was lucky to photograph a male, appeared to be a male Euphaea impar with clear wings at the Central Catchment Nature Reserve, off Upper Pierce Reservoir. I am not sure is this a juvenile male, where the dark patch on the hind wings has yet to be formed or a totally new subspecies. This male, perched quite lowly on a twig in an opened grass patch in the nature reserve, was displaying it’s iridescence wings in the sun. 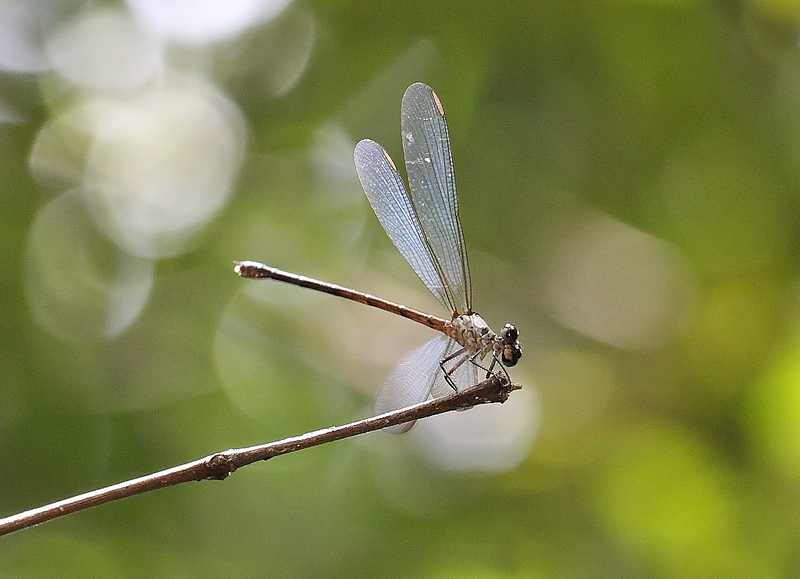 After stretching it’s wings wide opened, the male will then shut it’s wings again and folded above the body. He will repeat these opening and closing movements of wings on every new landing.. This was my first sighting of a hyaline wings Eupaea impar in three years, and I have not seen it again since after. 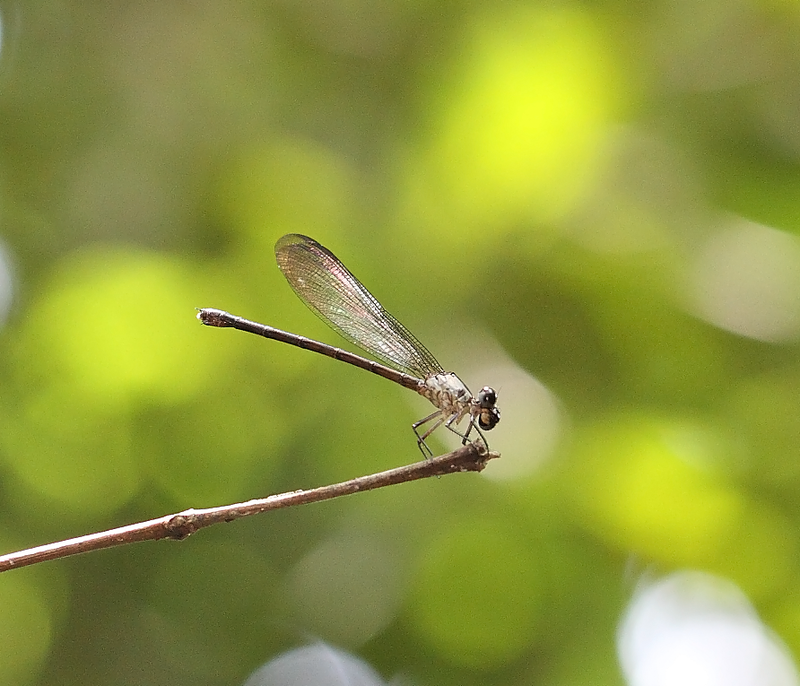 I was a little puzzle over this male individual as it was not found anywhere near to flowing streams and it seemed to enjoy perching in the hot sun. 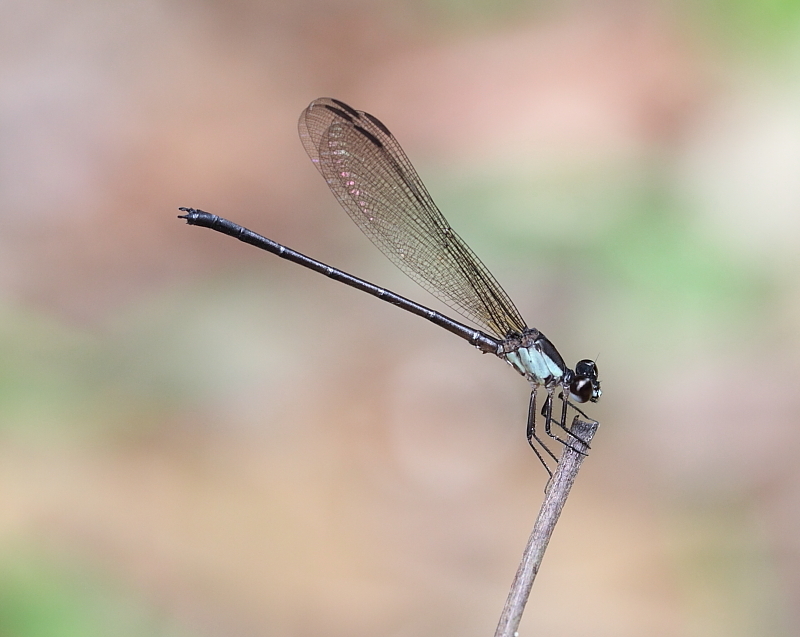 Blue-sided Satinwing is an uncommon damselfly species and confined only to the Central Catchment Nature Reserve of Singapore. 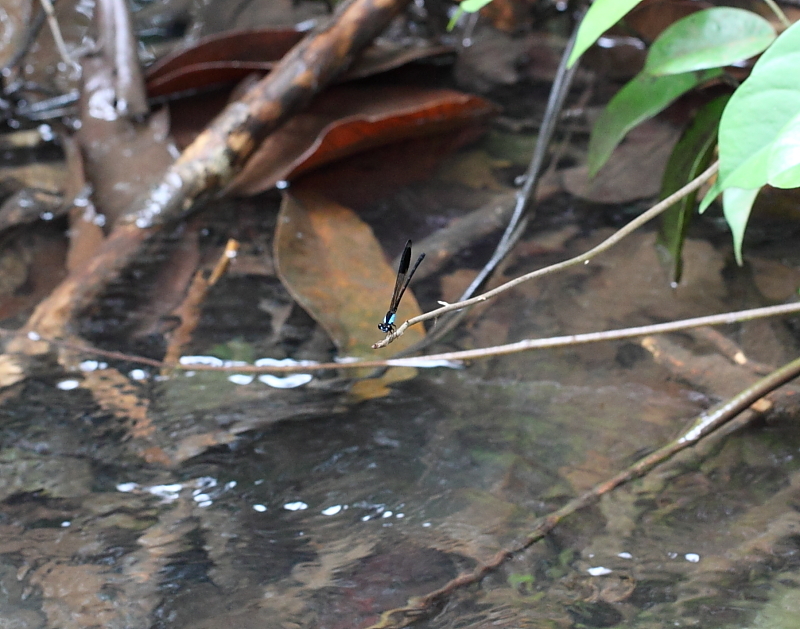 This species prefer slow flowing streams in the swamp forest of the Nature Reserve. 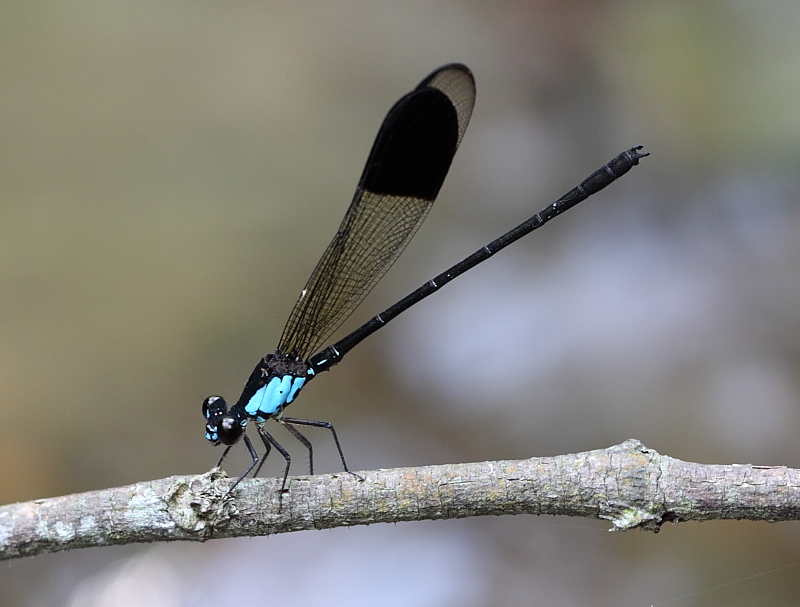 Male has blue patch to the sides of the thorax. 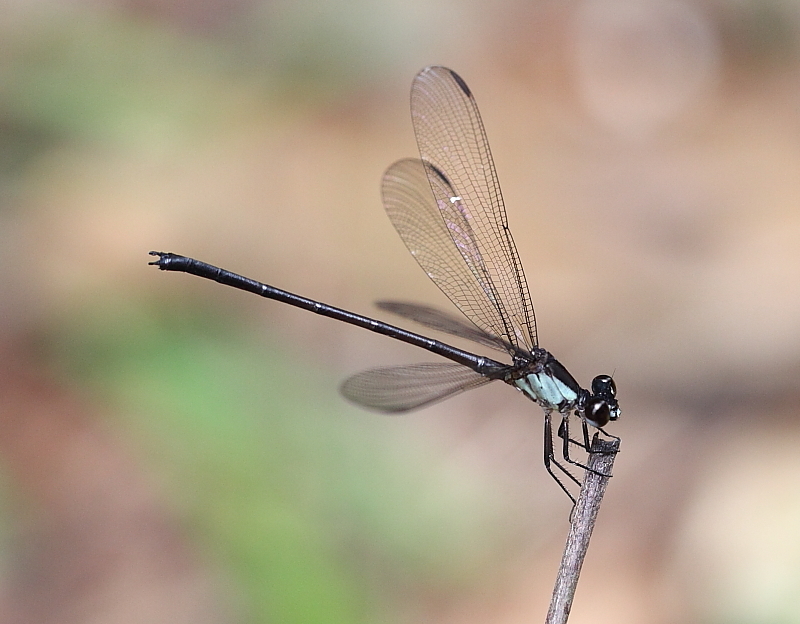 The dorsum of the thorax is black. 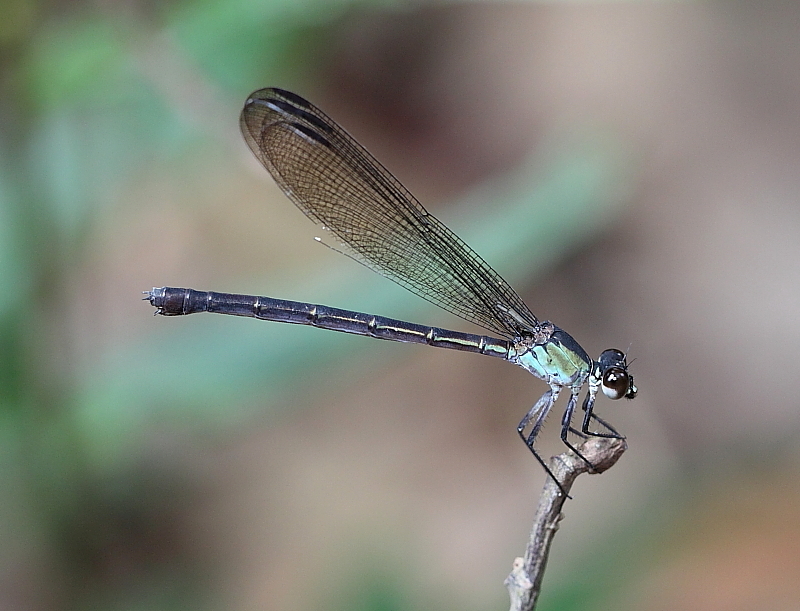 There is a distinctive dark patch on the hindwing. 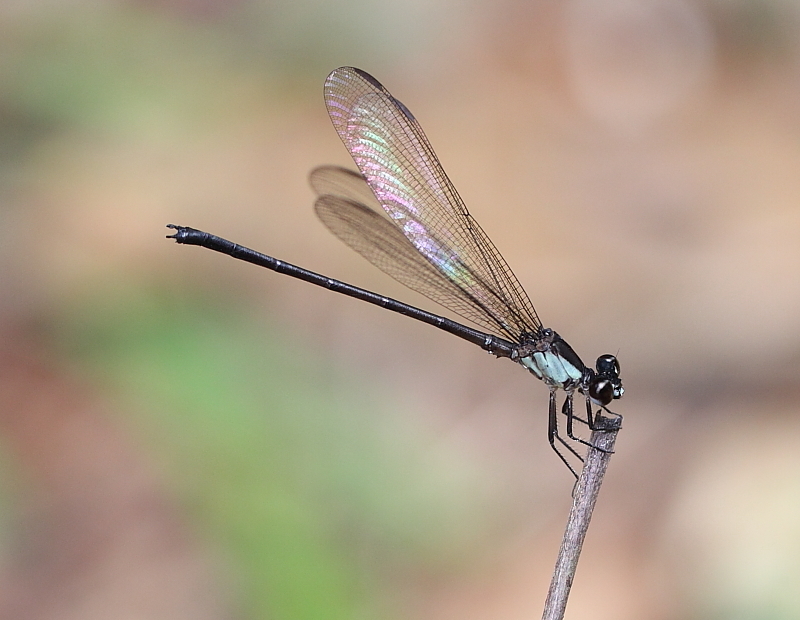 Female has clear, narrow wings and the thorax is dull olive. 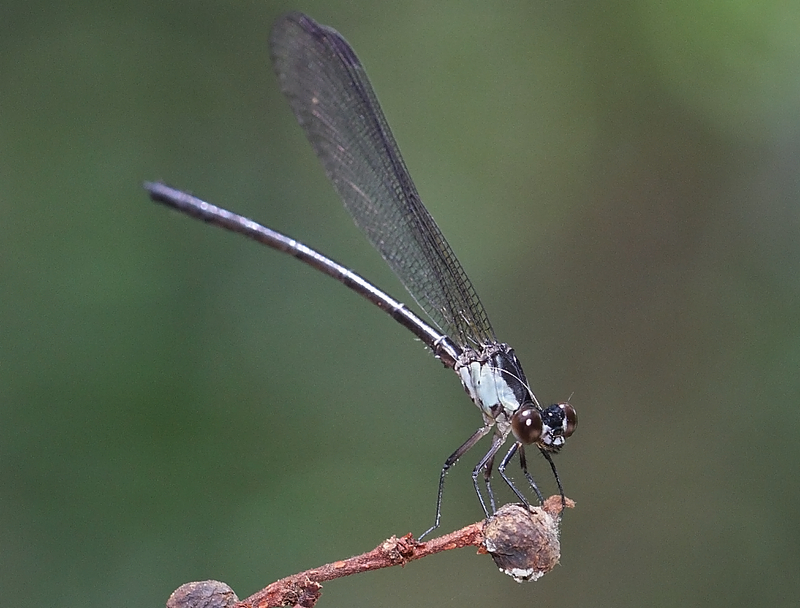 Males like to perch on twigs above forest streams. Once disturbed, they will embark on a short fluttery flights to a nearby perch. 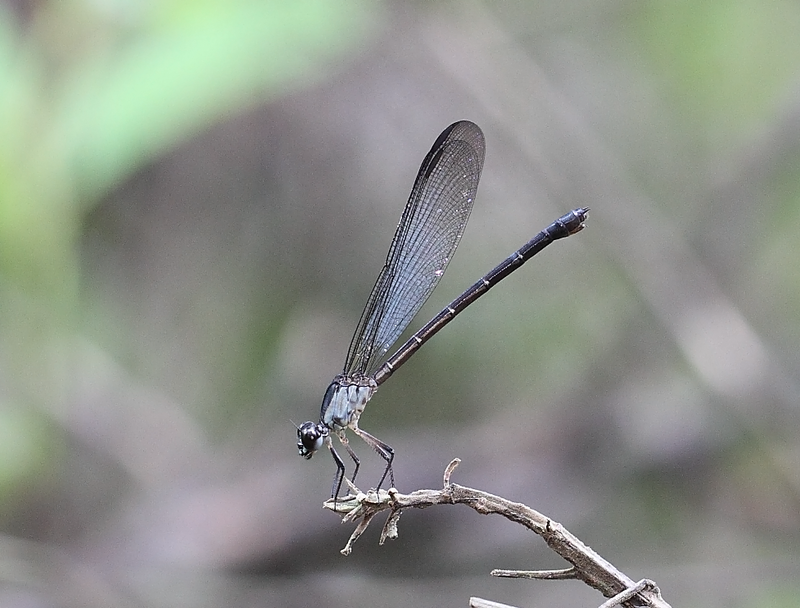 Females are less common and are often found far away from the streams. 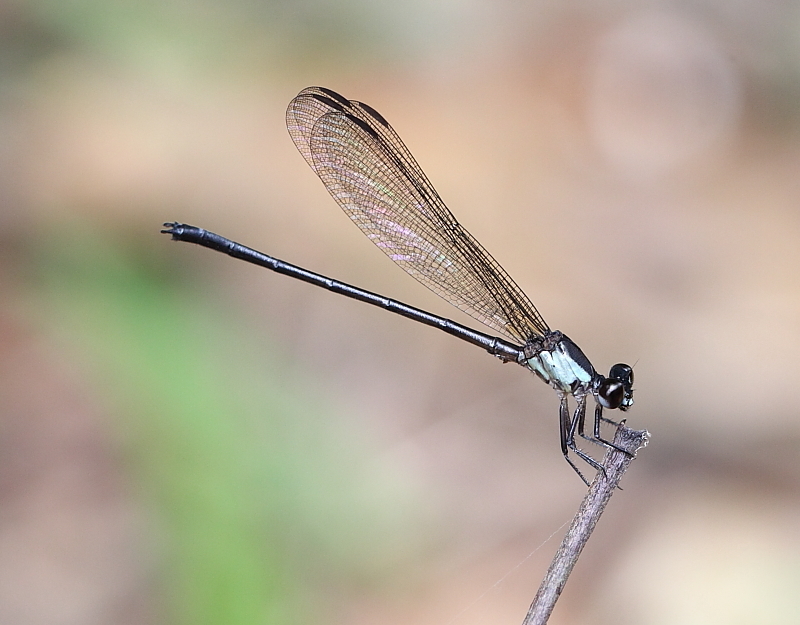 Click here for Euphaea impar (male with hyaline wings).